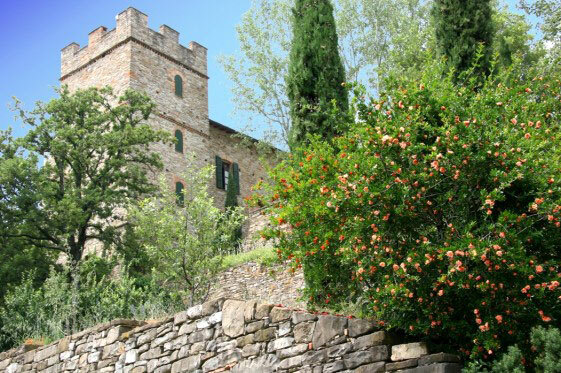 Notes: Montechino Castle is located in Montechino village, in the municipality of Gropparello, in the Riglio valley, Piacenza Province, Italy. It is situated on the crest of Monte Occhino hill, overlooking the Riglio river.The castle was built from large rectangular stones. It features an archetypical defensive tower topped by battlements with Guelphs merlon. These fortifications were needed during the 14th and 15th centuries when powerful rival families fought for control over the region. Still visible are the original decorative gables, the foundations of a medieval bridge, and the original drawbridge apparatus.